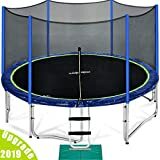 Skywalker Trampolines 12-Feet Jump N' Dunk Trampoline with Safety Enclosure ..
A trampoline is an exhilarating way to promote a fun and active lifestyle in children! Trampolines are used for exercise, competitive gymnastics, or backyard fun, but with so many options, choosing the right one to meet your needs can seem tricky. This buying guide will give you all the information you need to make the right decision, bringing healthy and safe fun to the whole family in no time! Classic trampolines: These large trampolines come in a range of sizes from 6 feet to 17 feet in diameter. They also come in a variety of shapes (rectangular, square, round, or octagonal) and need a minimum of 25 feet of vertical clearance. 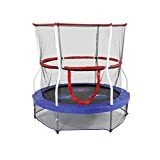 Classic Rectangular Trampolines: Rectangular trampolines are traditionally used for practicing gymnastics because their shape offers more jumping space and creates a higher bounce. 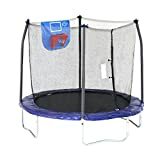 Classic Square Trampolines: Square trampolines are similar to rectangular trampolines. Jumps on square models are not quite as high as rectangular ones but they take up less space. Classic Round Trampolines: Round trampolines are the most common recreational trampoline style for backyards. 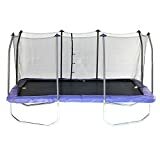 They offer overall good bounce space and height. 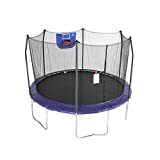 Classic Octagonal Trampolines: Octagonal trampolines are similar to round models but offer even higher bounce and a bigger surface area. The straight lines of the octagon shape make jumping easy as well. 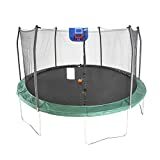 Mini Trampolines:Mini trampolines are large enough for one person to use at a time and are great equipment for indoor or outdoor exercise with little impact on the joints. Many mini trampolines can be folded up for easy storage when not in use as well. Setup: The best rated trampolines are easy to assemble and take little time or effort to attach all the springs and padding and start jumping shortly after. 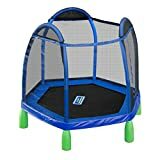 Mini trampolines that already have the mesh stretched across the frame are even easier to assemble and get good reviews. Safety: Reviewers rate trampolines that come with safety net enclosures the highest. Safety nets fit the trampolines they are manufactured for best and are easiest to set up when they are sold together and are an important safety feature. Sturdiness: Consumers rate trampolines that are the sturdiest and most durable the best, and they are happiest with products that withstand hours and hours of jumping, bouncing, and wear and tear from children. 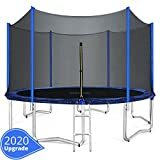 They also rate trampolines with weight capacity of about 250 pounds the best because they hold up against multiple members of the family jumping at the same time. Keep in mind the size and space you have, both in the yard and up in the air. About 25 feet of overhead clearance is the best for safe trampoline use. Look out for power lines, tree limbs, and other hazards when deciding on the size and location of a trampoline. Consider weight capacity when choosing a trampoline. 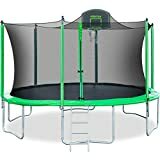 The weight capacity should coincide with the number of people who will be jumping at the same time and their combined weights to ensure safety while using a trampoline. For safe and entertaining play for hours, safety equipment such as enclosures and ladders are important features. Buying a trampoline set that includes enclosed nets will save you the hassle (and the cost) of buying one separately. The more springs a trampoline has the higher the jump will be. Bigger trampolines naturally have more springs to make the entire surface area bouncy. When shopping for a large trampoline, consider models with at least 80 springs for the best jumping experience. Look for trampoline mats made with Permatron Polypropylene, which is UV resistant and durable. This will ensure comfortable landing while bouncing. Mat covers also offer added protection and trampoline care when they’re not in use. 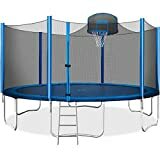 There are a variety of accessories that you can add to your trampoline such as basketball hoops and toss games. 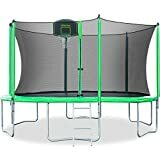 If you’re looking for extra activities and ways to use your trampoline, then keep these toys in mind. Skywalker: Skywalker believes in creating fun and safe game equipment that keeps children active and specializes in innovative production of classic trampolines, mini trampolines, and trampoline games. The company has recently been growing its line of mini indoor/outdoor trampolines for toddlers. Ultega: Ultega is a company that specializes in fitness & leisure and outdoor equipment. Its trampolines are made with galvanized steel and are the safest and most advanced trampolines for the price. Upper Bounce: Upper Bounce offers high quality products for low prices, safety, and customer satisfaction. 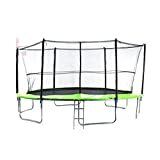 Its products include trampolines, trampoline equipment/accessories, and replacement parts. Pure Fun: Pure Fun is a branch of the parent company Pure Global Brands, Inc. The company’s trademark is creating “simply good products for real life.” Pure Fun was created to help children and parents have fun while staying active. Its trampolines have been proven to stimulate fitness and an active lifestyle in kids and adults alike.